10 years ago this month, my entire life was flipped upside down. This is a good thing, since the direction before that wasn’t especially exciting. I’d started following Jesus nine months earlier, but really didn’t have any life direction. I had pain in my back every day from an idiotic golf cart accident and soccer injury that had caused me to miss my entire senior season. I was attending a JC that I hated, studying things I didn’t care about. And my super awesome girlfriend kept breaking up with me (what a jerk). Even though I knew God had a plan for my life, I had a blank road map with no directions specific to my life. Then our pastor invited me to go with the students of our church to a weekend conference. I said I’d go, but knew it was going to be awful. I didn’t know anyone who was going except for the girl I’d been dating who had dumped me on Valentines Day (what a mean girl). During the entire car ride, rather than getting to know me people kept asking why we weren’t dating, in my heart’s memory, it was one of the most uncomfortable trips I’d ever been on. We got to the hotel, and I was thrown into a room with like 5 guys I didn’t know, and I got a real sweet spot on the ground to sleep. Needless to say, I was a little pessimistic about how the weekend would turn out. We went to the first service and my expectations were quite low. But that first night God messed me up. The speaker preached a message about Eutychus from Acts 20 (I’ve preached literally hundreds of messages that I couldn’t tell you the title of, but I remember this night well) and they threw a dummy off the balcony as an illustration. They ended with a call to come forward, and I sprinted from our seats at the top balcony to the front. At some point someone who spit in my face a ton as they prayed, prayed for me. God jacked me up. I left the service with no back pain (ever again) and an intense feeling that God really did have a plan for me. I slept little that night, not because of the smelly boys and the snoring, but because I just couldn’t come down from the high of the night. The next morning I anticipated God would do something great. I sat through the service, responded to the altar call and it was great. I was exhausted. By the third and final service, I could barely stand for worship. Sleep deprived, and coming down from the excitement of feeling God’s presence was overwhelming. Plus, I’d already gotten so much, I was sure it was someone else’s turn. It was at the end of the final service my life was changed forever. The speaker (one of my current all time favorites) pastor Benny Perez told the crowd that if they needed physical healing that God was going to heal it. As he counted to three, I remembered I didn’t need healing because my back had been healed the day before. But I’d also had a nagging ankle injury that never healed right. I’d been the team drug dealer when it came to over the counter pain meds my junior year. I’d pop more than recommended Alieve so that I could manage the pain. My foot dangled from my leg like well cooked spaghetti, and I couldn’t lock it in place. So when the speaker said to reach down and touch the part that needed healing, I grabbed my ankle. Instantly, I felt a heat rush over it, and all the pain was gone. I had free range of motion, and I could lock it in place! Then he prayed for me (my eyes were closed but my understanding is there were some karate moves involved:) I went down, and immediately God started speaking to me. This is when God told me I would go to Bible College, that I would be a youth pastor, and that within 2 years, I’d marry Amanda. 1 year and 2 months later we were engaged, and 4 and a half months after that we were married. 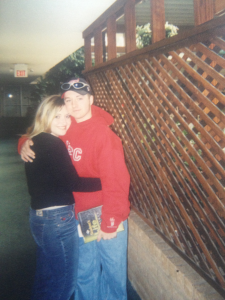 Phenomenon 2003 was the best weekend of my life except for the day in June 02 when I gave my life to Jesus. I enrolled in Bible college in 2004, graduated with my BA in 2006, and took my first position as a full time youth pastor in 2007. God did everything He said He would do. 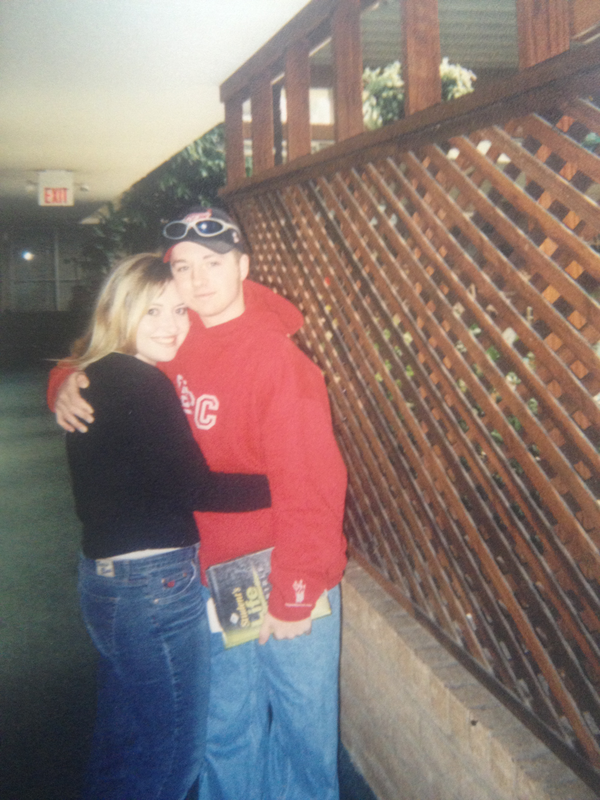 My favorite hat and sunglasses, with my first Bible, wearing my favorite red sweatshirt, with my favorite girl taken the night before God changed my life! Sean, You and Amanda are very special and I am very glad you had this weekend. I miss seeing you often.